"Best of Both Worlds." "The Inner Light." "The Visitor." "City on the Edge of Forever." It can't be argued Star Trek is short on episodes that represent the very best science-fiction possible. But what about those mid-tier television hours that are just really, really solid? The ones you may not recommend to friends, but are genuinely gratifying and smart entertainment? This week hosts Cam Smith and Tyler Orton, along with returning guest Jarrah Hodge of Trekkie Feminist and Women at Warp, name their favorite less-loved minor hits that nonetheless had a genuine impact on them. 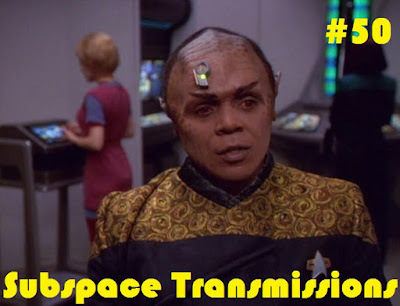 From Neelix and Tuvok's tragic amalgamation, to zenite-mining revolutionaries and the only on-screen adventure of Commodore Robert April, we cover all the series bases and find new appreciation for mid-level victories! Wanna appear on the show? Shoot us a 30 to 60-second audio clip letting us know what episodes you think are the HIDDEN GEMS OF STAR TREK and you could take the spotlight in an upcoming program! You can also send any other questions, topic ideas or feedback to subspacetransmissionspod@gmail.com!